What’s New: News from TAM of Nevada – TAM Card® Nation in Vegas! There is a common misconception that you must be 21 years old to obtain a TAM® Card, but in reality, TAM® training is available to individuals ages 16+. Please note that going forward, if you are under 21 years of age when you receive your TAM® Card, we will add ‘MINOR UNTIL month/date/year‘ on the card, above your name. TAM® of Nevada continues to offer classroom training and exam proctoring for online students in the Mesquite and Laughlin areas. Check our schedule to find the next date that we’ll be in your area. For our online students who wish to have their exam proctored in Mesquite or Laughlin, at the conclusion of your online TAM® class, please print the certificate of completion and bring it with you to the testing location, or take a picture of the certificate with your mobile phone and bring the picture to the testing location. This will help our exam proctors to quickly locate your record of completion, proctor your exam, and issue your TAM® Card. Students often ask us about the rules regarding who needs a Work Card (Sheriff Card) issued by Las Vegas Metro PD. Please refer to the LVMPD website for exact details. These rules do not, however, effect alcohol awareness card requirements. All sellers and servers of alcoholic beverages, including security professionals, are required to obtain their TAM® Card prior to the start of work. As a reminder for our students who needs to renew their TAM® Cards, our office has moved since you last visited. 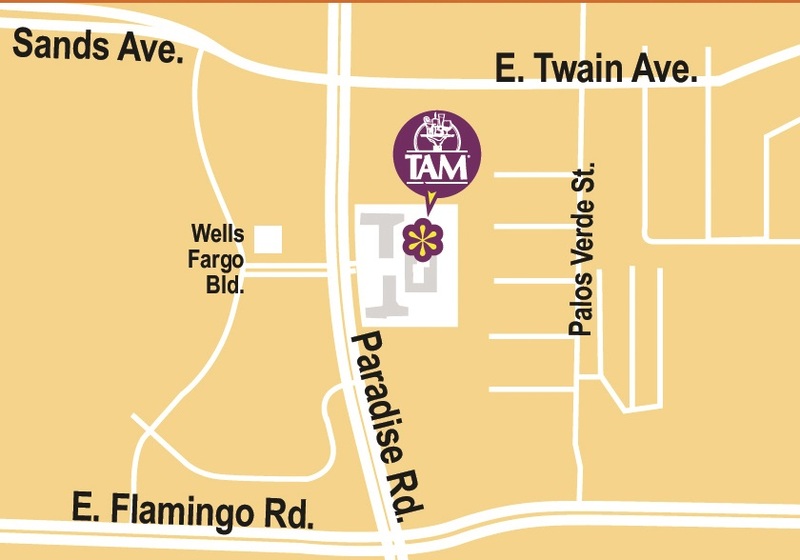 We are still located on Paradise, between Flamingo and Twain. You can now find our suite on the second floor in the office building located at 3900 Paradise, Suite 205. To find parking at our office, drive to the 2-story office building in the Park plaza. Standard and convenient parking for students is available on the side and rear of the building. Handicap parking is available in the rear of the building, and elevator access is available. Parking in the front of the building is limited-time parking only. Finally, we are happy to announce that TAM® of Nevada will be participating in the City of Henderson’s Community Expo on Saturday, October 18. The Henderson Community Expo 2014 combines three previous events into one: Community Health and Safety Expo, National Night Out, and City Hall at the Mall. Additional information will be available closer to the event date. We look forward to seeing future and returning classroom and online students in the coming weeks. In the meantime, visit us on Facebook with any questions or comments and keep the conversation going!